AirportWatch | Jet fuel price rose significantly during 2011. Oil likely to increase in price in 2012. Jet fuel price rose significantly during 2011. Oil likely to increase in price in 2012. The price of oil rose around 10 – 15% during 2011, depending which sort of oil is considered. IATA says the price of jet fuel rose by about 39% over the year, giving the average price of jet fuel in 2010 as $91.4 / barrel and the price in 2011 as $ 127.5. Some oil analysts think the price of oil will rise in 2012, even though the western economies remain in recession. Maybe as much as another $15 – 20 per barrel by next December. Demand from the emerging economies is likely to keep the price high. Crude oil is becoming more expensive to extract and this will add a premium to the oil we use in the future. DECC forecasts of future oil price are very low. Jet fuel price was 14.6% higher on 23rd December 2011 than a year earlier (price varies each week) . Various articles about the price of oil in 2011 and what might happen to the price in 2012. Oil prices predictions: What moved the oil price this year and and what will 2012 hold? ( a couple of extracts from the article) Oil prices climbed around 14 per cent in 2011 and traded in a narrow $20 range for most of the year – but the relatively modest activity hid tumultuous geopolitical events that created great instability, and which promise to hold the key for crude prices in 2012. 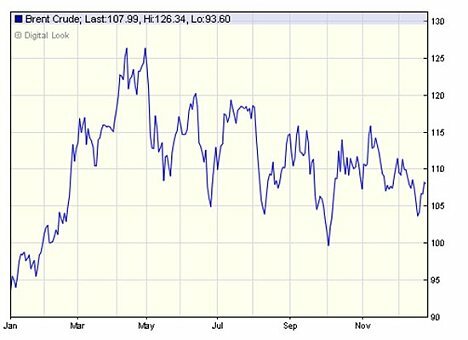 Brent crude prices grew from around $94 a barrel at the start of the year to around $108 now. Crude spent most of the year within the $100 to $120 range, spiking to $126 in April. Price movements this year have been shaped by government action, and inaction, social unrest and natural disasters. We take a look back at 2011 and ask where oil is headed in 2012. A year on oil: Brent crude rose to a peak in April before fears for the U.S. the European economies outweighed fears over Middle Eastern supply. The opposing risks of a eurozone collapse, hitting demand, and an Iranian stand-off, hitting supply, have led to a split among investors. Some are taking positions to benefit from a new super-spike while others are loading up on options that bet on an oil price collapse. Longer-term factors continue to put upward pressure on oil. Crude oil is becoming more expensive to extract and this will add a premium to the oil we use in the future. Any easing of demand in Europe and the U.S. as economies there slow, or even contract, are likely to be replaced by the ongoing growth in China and other emerging economies. Oil prices averaged $111 a barrel during 2011, up from $79 in 2010. Crude prices could stay at similarly elevated levels this year. Sky-high oil, it seems, is now compatible with Western recession. Commodity prices are compounding our economic woes, rather than helping us escape them. What’s changed recently is that even if the big Western economies remain sluggish, and our oil use falls slightly, the fast-growing markets of the East retain their insatiable appetite for crude. With per capita oil use across much of Asia still only a fraction of Western levels, and these countries engaged in the fastest, most widespread industrial revolution in human history, global oil demand keeps rising, whatever is happening in the West. During 2011, global oil consumption averaged 89m barrels per day, according to the International Energy Agency, the Western world’s oil think tank, up from 88.3m in 2010. The global economy was relatively subdued, but oil use still rose to an all-time high. Back in 2001, global oil consumption was just 76.6m barrels daily. So during the decade to 2011, worldwide oil demand rose 16pc. We now face another sharp rise, with global usage set to reach 95m barrels daily by 2016. That would amount to a 25pc consumption increase in just 16 years. The price of oil soared in 2011 and will finish about 19% higher, on average, after a volatile year dominated by concerns about global supplies. And high oil and gasoline prices are expected to continue weighing on the economy as it struggles to grow in 2012. “It’s like leaving the parking brake on while you’re trying to drive the economy forward,” said Michael Lynch, president of Strategic Energy & Economic Research. The bank anticipates crude oil prices will fall in the first half of 2012 to as low as $85-90/barrel. This morning Brent crude was hovering around $109/barrel. ,,,,Goldman Sachs, however, has taken up a contrarian position and reckons commodities could rally by 15% in the next year led by raw materials, with Brent crude seen surging to its highest level since 2008. Central forecast is $ 111/ barrel for 2012 and $117 in 2018 going up to only $130 by 2030, with the price about the same in dollars as the number of the year. High Forecast is for $ 112.5 in 2012, and $129 in 2018 and up to $170 per barrel in 2030. Compare this with the idiotic assumption by the government in 2008 that the price of aviation fuel would remain at 22p a litre until 2030, would remain still at 22p a litre until 2050, and still at 22p a litre until 2080 (Hansard 5 February 2008) – compare that to the price of petrol at the pumps now. The following table shows the resulting projections of aviation fuel prices in 2030 (in 2004 prices). UK Air Passenger Demand and CO2 Forecasts [(published 2007 and no longer available] also explains (page 48) that, after 2030, demand at each airport with spare capacity is projected to grow at the rate forecast for the five years prior to 2030. Demand at each airport is assumed to grow no further once its capacity is reached. This implicitly assumes oil and aviation fuel prices would be broadly constant after 2030. The chart shows the past UK government’s forecasts for the oil price together with the path that the price subsequently followed. Predictions are taken from the documents at http://www.decc.gov.uk/en/content/cms/statistics/projections/projections.aspx. So the year 2000 predictions turned out to be far too low, and were radically changed by 2005. These predictions were in turn radically changed in 2009. This poor record of past prediction is shared by many other organisations. This does not give any confidence in the latest price predictions. Yet the oil price has a major impact on individuals, organisations and countries, and the price of other forms of energy is closely linked. So we feel it makes sense to reduce your dependence on fossil fuels. You can reduce your dependence on fossil fuels, and your vulnerability to future oil price instability by calculating and reducing your carbon footprint. The charts were last updated in October 2011. They can be freely copied. Posted: Monday, January 2nd, 2012. Filed in General News, Recent News.